The Salecom range of high-quality panel mounting Miniature Toggle Switches available from JPR Electronics find many applications in industrial, commercial, telecoms, test, aerospace instrumentation, medical equipment, networking products and consumer goods. 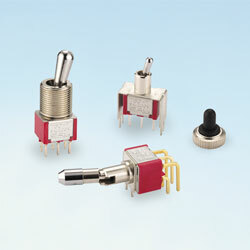 The Miniature Toggle Switches have a 10.41mm actuator length and are available in SPST and DPDT versions with contact forms including on-off, on-on and on-off-on. Momentary action biased versions are also offered. Key specifications of the T80-T series include, rated to 5A 120VAC/28VDC 2A 240VAC, operating temperature range -30C to +85C, contact resistance <10mOhm (maximum initial), electrical life 50,000 make/break cycles at full load, body material DAP, contact material silver plated, panel cut out 6.35mm, are UL approved and RoHS compliant. "Salecom is a major manufacturer of switch products whom JPR have represented for nearly 30 years.” Comments Paul Raynor, director of JPR Electronics,” Their business is based on innovation and customer satisfaction making them an ideal partner for our customers. With over 1,000 different permutations of switch available we are confident that we can provide our customers with exactly the right switch for their application."